The charismatic Mallee Emu-wren, once widespread in the Murray-Mallee region of South Australia and Victoria, has in recent decades, been restricted to a small network of Victorian reserves by a series of bushfires. Mallee Emu-wrens are specialised to live in hummock-grass vegetation, and while this key habitat eventually regenerates following fire, Mallee Emu-wrens have no capacity to recolonise such areas. Another large-scale bushfire could push the endangered Mallee Emu-wren past the point of no return. Monash School of Biological Sciences Senior Lecturer, Dr Rohan Clarke, and PhD candidate Will Mitchell are part of a dedicated nationwide team trying to bring the Mallee Emu-wren back from the brink of extinction. They have just recently been involved with the successful translocation of an additional 38 birds back into Ngarkat Conservation Park in South Australia. 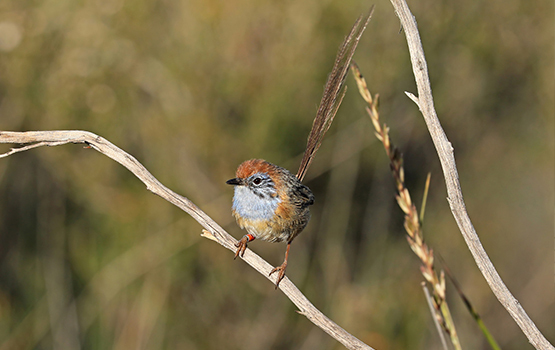 “In 2018, 78 Mallee Emu-wrens were translocated from Murray-Sunset and Hattah-Kulkyne National Parks in Victoria to Ngarkat Conservation Park as part of a trial to determine the suitability and effectiveness of translocation as a conservation strategy for the Mallee Emu-wren,” said Dr Rohan Clarke. “Using this translocation as a model system, we are looking at which planning, implementation, and long-term monitoring can be improved in translocations of threatened species,” he said. PhD candidate Will Mitchell said tracking of the released birds was difficult given their tiny size and elusive behaviour. “We were blown away when we found a significant number of paired birds with young fledglings,” he said. Will hopes that a key outcome of his research will be to provide a framework for conservation managers to assess how many individuals can be removed sustainably from a population for the purpose of translocation. “At a local scale, the successful re-introduction of the Mallee Emu-wren to Ngarkat Conservation Park will increase the global population of the species, provide an insurance population against further catastrophic wildfires in currently occupied Mallee Emu-wren habitat, and pave the way for larger-scale re-introductions into other reserves from which the Mallee Emu-wren has become extinct,” Will said.